For my daughter’s birthday this year, we threw a zoo-themed birthday party. Her love of animals and trips to the zoo made it an obvious choice. 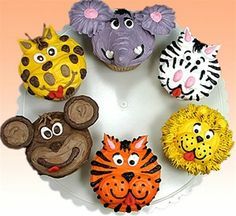 I decided to try my hand at cake decorating, so I created zoo animal cupcakes — zebras, lions and tigers — to celebrate her big day. I have zero experience with cake decorating. I visited my local cake supply store searching for expert tips and the right decorating equipment. I brought this picture and the store employee directed me to a few piping tips, piping bags and coloring for the frosting. I also found these eyeballs, perfect for giving the cupcakes a cartoonish look. Once I had all my supplies, I baked two dozen funfetti cupcakes and used this buttercream recipe for decorating. I divided the frosting into four bowls — yellow, orange, black and white — and frosted 6 cupcakes each of the colors. I filled piping bags with black, yellow, and orange. The black was used for all of the stripes on the zebras and tigers, and for the mouths on all the animals. I used a small tip for piping. I used a grass tip for the orange frosting, to create the lion mane. For the lion and tiger ears, I used a slightly larger round tip, and for the zebra ears, I used a v-shaped tip. Bake cupcakes per the package directions. Divide the frosting into four bowls and add food coloring until you get the desired black, yellow and orange colors. Frost 8 cupcakes yellow, 8 orange and 8 white. Add black frosting to a decorating bag with a small metal tip. Pipe mouths onto each of the animals. Add stripes onto the zebras and the tigers by creating mini triangles on their cheeks on between their ears. Place two eyes on each cupcake. Place orange frosting in a piping bag with a grass tip. Create the lion mane by piping outward while squiggling your hand toward the liner. Change the tip to a round tip to create the ears for the lion. Fill two more piping bags, with white and orange to create the other animals’ ears. Serve within 24 hours — DO NOT cover the cupcakes in an airtight container before serving, as the moisture will make the eyeballs bleed and soak up the frosting coloring.